PythonBrasil is the national Python community conference that happens every year, usually in October, in Brazil. I attended PythonBrasil for the first time in 2016, the year we had started PyLadies Porto Alegre. Back then, we were a very small group and I was the only one to go. It was definitely one of the best experiences I ever had, which, of course, set a very high standard for every single tech event I attended afterwards. Because of the great time I had there, I wanted to bring more and more women from PyLadies Porto Alegre to experience PythonBrasil in the next editions. So, during the PyLadies Porto Alegre 1st birthday party, I encouraged the other women to submit activities to try and to go to the conference that would happen in Belo Horizonte. When attending it for the second time, I didn't go alone. Daniela Petruzalek had her talk accepted. Claudia, also from PyLadies Porto Alegre, was able to go, for the first time, thanks to the support of the PyLadies Brazil crowdfunding campaign. To me, one of the most memorable things about this PythonBrasil was "The (unofficial) PyLadies House", where I stayed. It was a huge house that we rented and shared between about 18 people to help with the accomodation costs for all of us. We shared breakfasts and rides and stories. We watched other PyLadies rehearse their talks, made lightning tech talks late at the night and we even had a birthday party! So, this year? The idea of encouraging PyLadies POA submissions, something that had came up almost spontaneously last year, matured and we have worked to make Pyladies Porto Alegre 2nd Birthday Party an all-day event with that purpose. The schedule? Lightning talks about Python projects from its members, talks about experiences as participants and as speakers at Python Brasil and... we also had a help from Vinta Software's Flavio Juvenal, who acted as mentor to the women who were considering to submit an activity to PythonBrasil. He even made a great Github repo with a proposal checklist to assist us - and he made himself available for reviewing the proposals we wrote. The result? 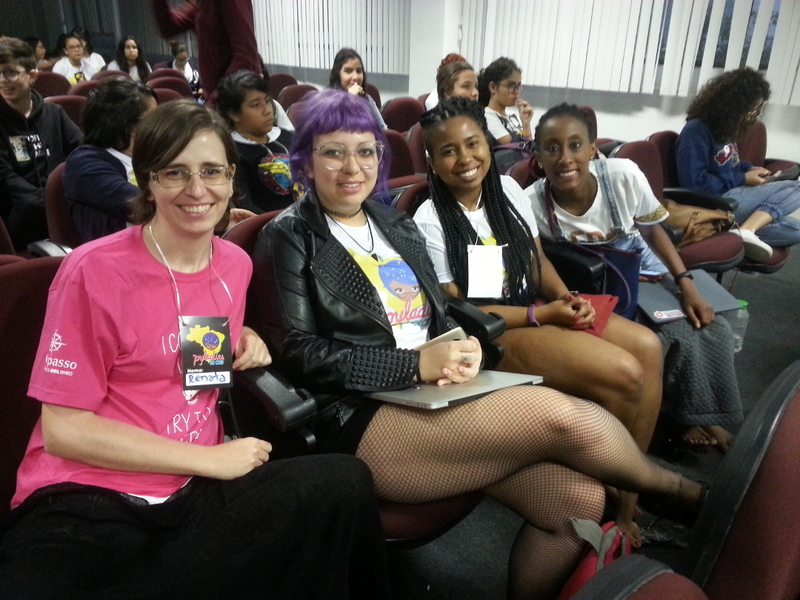 We had more than 6 women from PyLadies Porto Alegre with activities accepted to PythonBrasil. Some of them even had more than one activity (tutorial and talk) accepted. I was among the ones who had been accepted. Ever since attending the conference for the first time, it had been a goal of mine to give a talk at PythonBrasil. But not any talk. I wanted for it to be a technical talk. At last, what I learned during Outreachy and how I had used it for a real task in a job finally gave me the confidance to do so. I felt ready, so I submitted and I was accepted. I made my way to Natal, the capital of the Rio Grande do Norte (RN) state (in the Northeast of Brazil) two days before the conference was to start, since it was the cheapest ticket I could find. Besides, the PyLadiesBRConf was scheduled to happen on the day before and I was hoping I would be able to attend. PyLadiesBRConf was a full day of talks organized by what one could have called "the original PyLadies Brazil", since the Pyladies community in Brazil actually started in Natal and was named so (afterwards we started naming the group with cities' names). On the next day, PythonBrasil started. It was the biggest PythonBrasil to happen yet, with over 700 atendees (plus staff). Like many PyCons, the conference days are usually split between tutorials, talks and sprints. The tutorials have free admitance and are open to anyone to attend (no matter if they have bought a ticket to the conference or not). Unfortunatelly, due to the capacity of the rooms where they would be held, there was a limit for 100 registrations for each tutorial. When I went to register for the tutorials of the first day, they were already all booked. Even so, the tutorial I was most interested in, "Builting REST APIs with Django REST Framework", had to be cancelled anyway because the presenter missed his flight. :( On this first day, I met with a few PyLadies and people from the Python community who were in Natal, I walked on the beach and I focused on the preparation for my talk. I must confess that I had registered for the tutorial on Pandas ("It's not witchcraft, it's Pandas", by Fernando Masanori) merely because Flavio Juvenal had mentioned Pandas on the feedback for my proposal. I had no idea what that was actually about and why would one even use Pandas. By noon on that second day, though, I was so very glad that I did (and that I got a spot in it!). I learned a bit about Pandas and I also learned about how to use Jupyter Notebooks, something I had never tried before either. I found both Pandas and Jupyter easy and interesting and I look forward to do some projects using them. Back when we (PyLadies) were discussing submissions to PythonBrasil with Professor Masanori, Data Structures was something that both I and another PyLady (Debora) had mentioned we had been meaning to focus on and study more. So, he came up with the idea for a tutorial about it, called: "Data Structures are <3". On this tutorial, I found it quite interesting learning and playing with recursive functions and with algorithms for searching. I was quite impressed with learning about heapsort (who knew doing such a thing could be so cool?). Everything at PythonBrasil (tutorials, talks and sprint) happened in the same hotel. So, after the tutorials were over, I hung around with some of the people of the community who were staying at the same hostel. The organizing team asked for help in putting together the conference kit (bag, t-shirt, IDs and flyers). We made sort of a production line and cut the time considerably short for the volunteer team. Afterwards, I was still processing everything that I had learned and I wanted to try the new things, so I went back to the hostel to code some more. I confess that I was so hooked that I stayed up until 2 am to create the code with Pandas that I would incorporate in my talk as a bonus content. On this day, I had the opportunity to meet and socialize with a lot of people who were coming to Python Brasil for the first time. It was particularly delightful to see a lot of students from a public technical school (Instituto Federal) attending the conference with their teachers. They had been given tickets, which allowed them to attend the (otherwise very expensive) conference and I must say that this is the kind of inclusion that I always want to see in tech events. From the talks, I want to highlight these moments: I learned about Scrapy (which I have been playing around a bit since then), I watched an awesome talk about using Python with Physics (although I don't have a depth knowledge of Physics, I count as a success that I could follow the talk in it's entirety, so cheers to the presenter, Ana Maria, from PyLadies Teresina) and I must mention that I was quite impressed by Elias Dorneles' talk - about developing software for the command line. Even his "slides" were made there - and there was drawings and music too, all made with Python and using the command line! The second day of talks brought us the much needed talk about AfroPython, a initiative that was created to increase representation of black and native brazilian people in our community. A talk that gathered a lot of attention (and overcrowded the room it was being given at!) was the one about using Python to understand data about suicides to help preventing them. It's a hard subject for many people, but it is one that we definitely need to talk about. Andreza Rocha's talk "Dear White People (from HR)" also touched a lot of people. She drew from her own experiences as a tech recruiter to question about the homogenity that we (still) have in tech. "Who are the ones who recruit the people?" she asked. "For us to be recruited, we (black people) have to be alive." Contrary to popular belief, yes, I did watch the last keynote of the day, even though it was Facebook's. And it did surprised me. Rainer Alves spoke about the shifts in corporate culture that happened when they merged infrastructure and development people into a "Production Engineering" departament. What I found most relevant, though, was the slide below, about "Blameless postmortens". After all, how to actually correct a malpractice or an error other than working collectivelly to figure out the way? "It's not about what you did, it's about what went wrong." Sunday arrived and it was time for: 'But can you open it on Excel?' Exporting to TXT, CSV and JSON with Python ("'Mas dá pra abrir no Excel?'' Exportando para TXT, CSV e JSON com Python"). The focus of my talk was how to export data to those formats using mainly the tools offered by the Python Standard Library. But, as I mentioned before, thanks to what I learned during the PythonBrasil tutorials, I was able to add some extra content and show how the export to CSV could be done with Pandas as well. I was very glad about this, even though I felt like there was so little time to go over all the content I wanted to present (I had time to go through all my slides and for a very brief demonstration, but that was it). I think it went well. I even managed to speak briefly about Free Software (since I don't use Excel, and I made my demonstration with LibreOffice). When they opened time for questions, I explicitily said "Questions, not comments, please" hoping to avoid mansplaing or another incident like the one that had happened the day before. And I know people judged me for that, but... I am also aware they judged me more harshly because I am a woman. After all, in previous editions we have had male keynotes making the very same comment without people being offended by it. This did not stop people from coming to talk to me afterwards with comments about their experiences anyway - that was definitely better, because I felt like I could talk to them more properly and personally about it, having more time than the 5 minutes alotted to questions and not having to answer under a full audience's scrutiny. Other than my own talk, I would like to mention some other talks I attended. There was a talk about advanced functional programming ("Going further than map, filter and reduce"), which is something that I find interesting to have some idea about it, even though I don't quite fully grasp yet. There was also the PyLadies' talk, where a group representing each region of Brazil with a PyLadies group talked about the work we have been doing. Andressa went on for PyLadies Porto Alegre and talked about all the work we have been doing in particular regarding all the Django Girls workshops we have helped at in Rio Grande do Sul since the last PythonBrasil. Ana Paula made a fun talk about Genetic Algorithm with Python, which uses the language to work with Biology data. Another subject that I am not very familiar with, but that I found quite interesting. And I also saw Camilla Martins live coding to run Python with Node.js on the big stage. During the lightning talks, something amazing happened: the Instituto Federal students went up on the stage and talked about their experience at PythonBrasil using a regional sung-poetry called Cordel. It was really remarkable. Also during the lightning talks, we had Thrycia Oliveira, a former participant of Django Girls, calling to attention the fact that we need to have spaces that are inclusive to parents in the community, in particular to moms. She said that PythonBrasil organization tried to arrange so, and she thanked them for that, but it had not been possible. I also remember when she told me about her participation in Python Nordeste (a regional conference that preceeded PythonBrasil) and how she had to alternate with her husband the days she went to, because one of them had to stay at home to watch over their kids (it wasn't really a kids-inclusive event). This day ended with Betina's keynote "Does this algorithm have a soul? ", a very relevant question for the state of software development today. Her talk spoke to me and to a lot of people in the audience and I can't picure a more welcoming community to be given to. Sadly, Python Brazil had to come to an end. Day 6 happened on a Monday, and that meant that the majority of the people, including almost all the Pyladies, had already returned home. :( For personal reasons that I would rather not talk about publicly, I chose not to take part on the coding sprint to help with APyB's site. Instead, because I am looking for work, I used this day mostly for networking and applying to jobs I had heard about during PythonBrasil. I don't have wifi at home and I need to take any opportunity I can get to use the internet to send CVs and taking technical tests, so that is what I did. 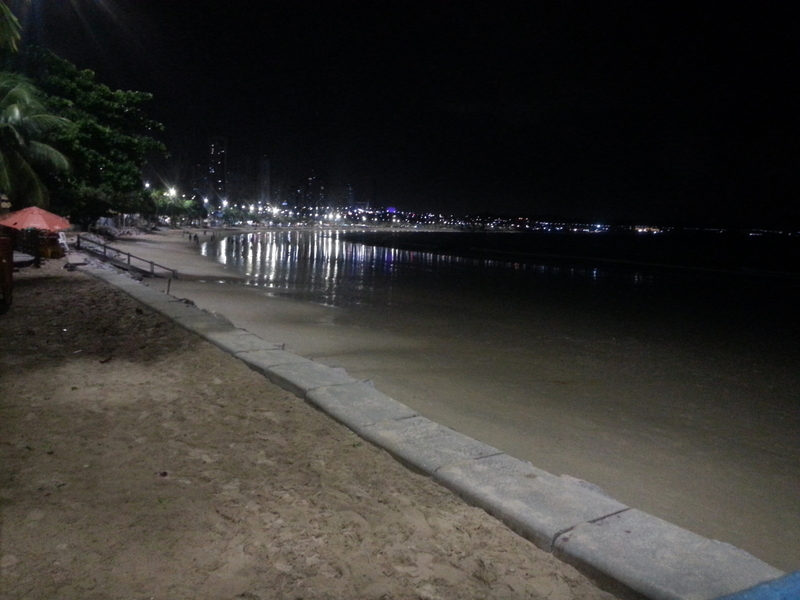 And, of course, to finish this post I ought to mention the beach... On my last two days in Natal, I was gifted with the awesomeness that it is the ocean at Ponta Negra during the full moon. There are no words to describe the beauty of it (I am sorry I couldn't take a good picture of it). I know this post ended up being extensive, but how can one summarize an experience with an event as huge as PythonBrasil? It's hard. I think it's safe to say that to be part of something like that has a lasting impact in my life. All the technical content I have heard about gives me motivation to keep studying and learning new things. All the people I have met, friends old and new, give meaning to the work to make the Python community more open and inclusive. So, I cannot thank Outreachy enough for making my participation in Python Brasil possible! The original content written by Renata has a Creative Commons Attribution 4.0 International License. Other content may be subjected to other licenses. Blog powered by Pelican, which takes great advantage of Python. Theme pelican-simplegrey with pelican-bootstrap3 inspired code highlights.